Bob Brewer looks back at the rich (and dark) history of porter. All historical references to “porter” seem to go back to 1722 and one Ralph Harwood, a London brewer. Harwood created a beer that was originally called “Entire.” Entire previously had referred to a blend of three separate beers, consisting of one third each beer, ale, and strong beer. This blend was also known as “Three Threads,” probably vernacular for “three thirds.” Prior to Harwood, Entire was mixed in the bar at the point of service. Entire quickly became popular as the workingman’s pint of choice, and as several historians seem to think, became known as “porter” because it was a particular favorite of the porters who labored at the local markets and also delivered the product to the pubs. 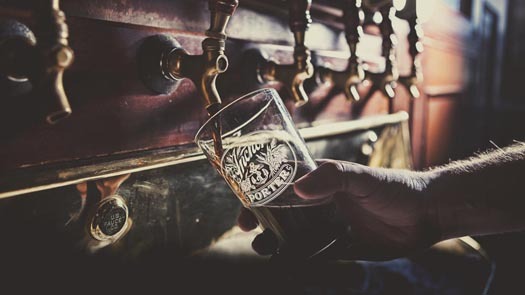 Due to the lengthy aging required, porters were among the first beers to be made by freestanding breweries rather than by the pubs themselves. Only larger breweries had space for the huge vats necessary to store beer for extended periods of time. Over time the styles evolved. 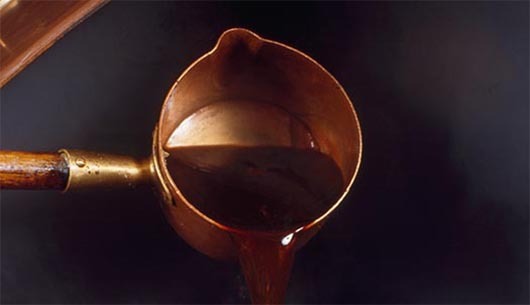 Increased taxation brought about milder versions, and Wheeler’s invention of the malt roaster in 1817 made black malt available for the first time. Porter made its way to Ireland in 1776 and Guinness was brewing it a few years later. The Irish made several versions using mostly pale malt with enough black malt to give it its signature dark color and somewhat burnt flavor. The most common of this style was called “plain porter” or just “plain.” There were also “export,” “stout,” and ”extra stout” versions – the latter ultimately shortened to simply “stout,” which is the principal Guinness product today. English porters persisted from the latter part of the 1700s through the 1800s, eventually making their way to America and to Russia and the Baltic countries where they evolved separately. During this time the terms porter and stout were used interchangeably, as were the brewing techniques. The Baltic porters were influenced by German lager brewing and became a bottom-fermented black beer, usually of higher ABVs (alcohol by volume). The Russian variant became known as “imperial stout,” probably because it evolved from stout imported from England for the consumption of the large British diplomatic community that sprang up in St. Petersburg, especially after the marriage of one of Queen Victoria’s daughters to the Czar. Somewhere along the historical timeline the term “imperial,” when applied to a beer, became used as an indication of high ABV rather than a reference to the Imperial Court. Porters came to America along with the British and were known as early as the late 1700s. Again, there were separate stylistic evolutions and these beers, whether called porter or stout, were brewed here until they fell out of favor around the time of WWI. They all but disappeared with Prohibition. A similar fate befell the British porters by 1940 or so with the style niche completely taken over by stouts. The Irish hung on a little longer, with the last porter produced by Guinness in 1974. Baltic porters continued to be produced in Eastern Germany until the 1990s but stylistically they were more of a schwartzbier, or black lager, than a porter or stout. It took the Americans to revive the style. Even though lagers had taken over since their introduction to America around the 1850s, most of the smaller Western breweries produced a porter until Prohibition. Anchor Brewing Company had done so as well, and in 1972 became the first American craft brewery to brew a porter post-Prohibition, followed by others soon thereafter. A brewer takes a sample of Anchor Porter wort from the brew kettle. Roasted malts give the beer its rich, dark color and flavors of toffee, dark chocolate, and coffee. Starting in 1979, British craft brewers followed suit, and today there are again commercial examples of the style being made by major British breweries. So, what is the difference today between a stout and a porter? Good question. The easy answers are “not much,” or “depends on who you ask.” There are more stylistic crossovers and intertwined history between modern stouts and porters than among any other two beer styles. Consider the evolution of brewing along with international variants, throw in the craft brewers with their interpretations, and spice up the whole equation with our vibrant and creative home brewing community and we have style lines that almost defy description. Our friends with the Association of Brewers (AOB) and the Beer Judge Certification Program (BJCP) have broken the styles down for us. Porter has three designations: Brown Porter, Robust Porter, and Baltic Porter. Stout has the distinction of having six designations: Dry, Sweet, Oatmeal, Foreign Extra, American, and Russian Imperial. The main difference between the broader styles today seems to be that stouts are drier and toastier, and porters are more malty and full-bodied. Whether called porter or stout, either can be top or bottom fermented, have high or low hop rates, or be moderate to high in alcohol. They can also range in color from medium brown to completely black. Now that I’ve cleared that up, I’m reminded of the time some years ago when I discussed this very same topic with the late Michael Jackson. The beer guy Michael Jackson, that is. We were well into a lengthy sampling of rare single malts when the conversation came around to the stout / porter issue. I asked for a simple clarification of the stylistic difference because I considered it to be one of the more confused and ill-defined. Michael’s reply was that it was actually the MOST confused and ill-defined. He furthermore stated that even the best-researched and well-intended writings on the subject were “as unambiguous as a horoscope.” I took the master at his word and we ordered another round. Anchor Porter falls into the Robust Porter category as defined by the BJCP. It has a deep black color with a full, tan-colored head. It also has moderately strong malt flavor with some coffee, toffee, and chocolate notes, medium bitterness, and a slightly sweet finish. Overall, Anchor Porter is the epitome of a handcrafted dark beer with a complex character. Often described as the definitive American porter, this rich, flavorful beer pairs perfectly with seafood. 2012 marks 40 years since we first brewed Anchor Porter, so let’s raise a glass to celebrate its 40th anniversary! Very cool history. Lots of interesting stuff I haven’t seen posted before. Great beer style. Excellent information on Porters and Stouts. I’ve heard bits and bobs over the years, but this sums it up nicely. Cheers! Don’t we really owe it to the world to learn all we can about beer? Thanks guys, for making me a better person. Really, very cool article. Anchor Porter if the bomb! I see your having fun with lager and others, just never forget , it’s all about Anchor PORTER! A bar called The Moon and Sixpence in Portland Oregon had this on Cask for a small while about a decade ago and I would travel all the way across the city for the reward of this perfect beer. I look forward to the day when our paths cross again.